This is very bad blog-practice, but today I'm posting the exact same thing as yesterday, only better. I have now taken the additional several hours necessary to go through every OPEC Monthly Oil Market Report back to 2001, and every IEA Oil Market Report back to 2000. I have also paid my $75 to get the latest Oil and Gas Journal stats through November 2011. Therefore I am able to present the above graph in which the average line is based on all five data sources, and all five data sources are as complete as it's presently possible to be. 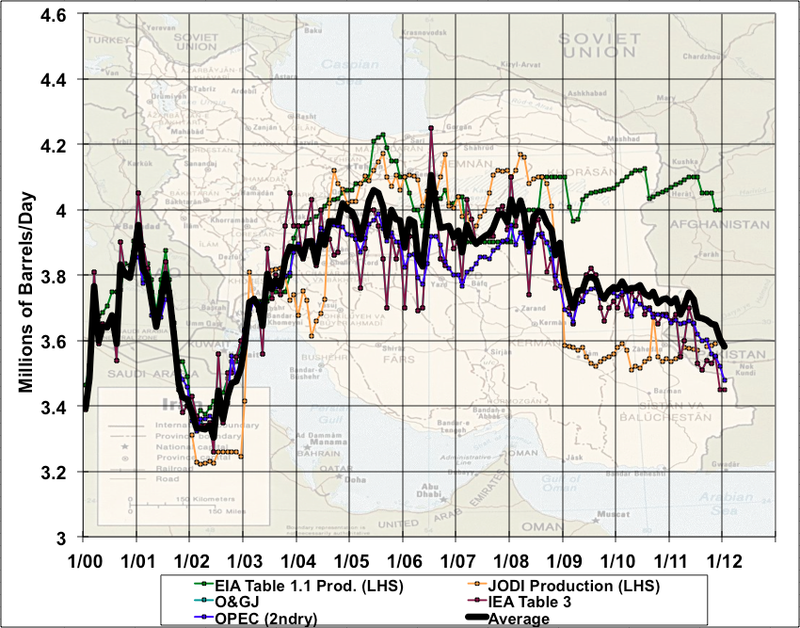 I apologize for the tedium, but given the importance at the moment of understanding the effects of the sanctions on Iran, and the likely prospects for war with Iran, it seems worth investing the effort to marshal all the available data on the country's oil production. My interpretation of the above is that Iran used to be able to produce about 4mbd of oil. They voluntarily reduced production following the 2001 recession (in line with the behavior of other OPEC nations at the time). However, while the reduction at the end of 2008 may also have been voluntary, the fact that they've made no increase in production in 2011 -- the opposite in fact -- suggests they've lost the capacity to produce (or at least export) that much oil. I assume this is due to western sanctions. Staurt, This leaves me wondering if the 'nuclear threat' issue is an attempt to keep that oil in the ground. Thanks for the updated chart. I can't see the O&GJ line. Is it hidden? This is *not* true for Saudi Arabia (for example) so I wasn't expecting it. Alex - the BP data are annual averages and only go through 2010 currently, so they don't provide a ton of insight into the most recent trends compared to the various monthly sources.